But Plone permissions already handle all this. If user does not have permissions to add new content types, import would error. We've been over this point a lot in other threads. The goal is not just export from plone, import into another plone. The goal is to allow a non technical user to work with existing data they might have and existing systems they might have, and move data into and out of plone. If this also allows for the ability to move data between plone sites then that is a secondary benefit. The task is really, can I import some data I have lying around? Can I bulk update some content already in plone with just some specific metadata. Can I grab some metadata from a subsection of plone and see the ownership info and import that into some other system to get a report? CSV seems the most universal, non technical user friendly format to achieve this. JSON is only included just because all all teh developers seem upset if its not included. Also, if the embedding json snippets inside CSV idea doesn't work as a way to include structured data in a CSV format. ie it could be that CSV only support partial data and JSON supports full data. OK - that does make sense. Carry on! "CSV is the data Kalashnikov: not pretty, but many wars have been fought with it and kids can use it." Is that an argument for, or against? it will likely pop open an Excel/Libreoffice import window which looks satisfyingly techie enough to be confident that you're really getting data, but not scary enough to make you go running for the hills, like a json file would. And should. Hello everyone, I have submitted my proposal. But there are still many specs which are not frozen yet like development model(probably Agile Process will be used and timeline will be updated accordingly), desired data format and permission access. Thus proposal is not the final PLIP and Timeline is only raw but will be reformed as per the final decision discussed here. I hope members keep this in mind while reviewing it. I learnt a lot of things in the past one month. The discussions with the mentors and community members opened up new areas of learning for me. I will keep in touch with the community, however, due to my college studies and exams, I won't be able to contribute in the same way as I did in the past one month, but as a commitment to this community, I will keep on contributing as and when time allows me. Also, I too feel that CSV is the desired data format. 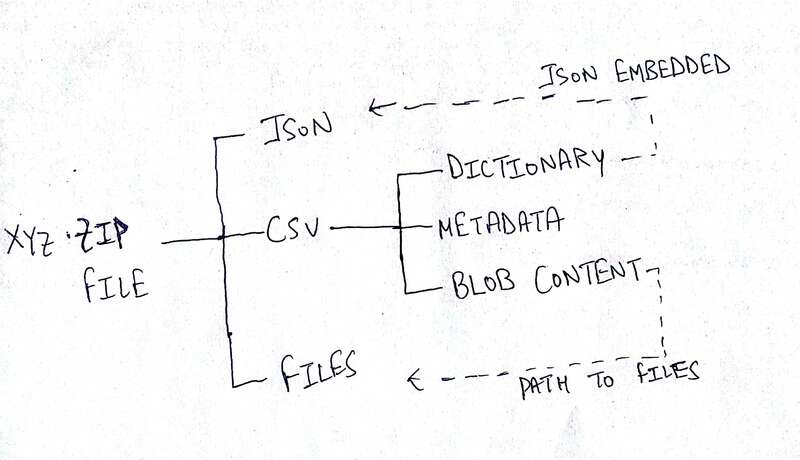 Here is an image of file structure I have drawn on my board. IIRC, the use-case for that was to make load into RDBMS type cases easier, but that it was considered optional-scope by most of the discussion participants in the comments of the original PLIP (https://github.com/plone/Products.CMFPlone/issues/1386). Accessible yes... though, there may be some cases where CSV cannot do lossless round-trip out-and-back without resorting to clever (or unreadable) encoding. Update: to amend why the above might matter: some folks want to have non-binary backups of their "content". When people use RDBMS, they can get SQL dumps, so they sort of expect that there is both a degree of non-lossy and portability. I can imagine people want to move content from one Plone site to another without loss, too. I'm not sure where that came from. I dont think this is a big usecase. but that it was considered optional-scope by most of the discussion participants in the comments of the original PLIP (https://github.com/plone/Products.CMFPlone/issues/1386). The majority of the participants are highly technical and highly technical people have different priorities. Forget CSV, export to Excel. Excel is still the standard throughout the world - like it or not. Python has decent Excel support and Excel allows to have typed columns making a lot of things easier than with CSV. The Kalashnikov is the solution if you are too dumb to kill someone with a hammer. Python has decent Excel support and Excel allows to have typed columns making a lot of things easier than with CSV. We used openpyxl, xlwt and xlsxwriter in different projects...honestly no special preference for one of them. Would that be the air velocity of a European or African unladen swallow? Decimal comma or point? (I've wept many a tear over the supposed 'typedness' of Excel sheets. Oh what a standard). Yes it will include CSV. Because the goal is a data exchange with plone for non technical users. Not just data exchange between plone systems. Mostly for reference, this is an example of how a commercial CMS provides a very polished approach to CSV import. Hey everyone, I'm super pumped up and all set for a great summer ahead. This is my first ever FOSS project and I may not be consistent with the community expectations, so I request you all, to point me out where so ever I go wrong. Mentors, it's your call, as I have not much experience with any of the two but with this platform. Anyway this raise a problem in my mind. Are we solving the cross platform migration of data? If so, how? I just realised that Franco Pellegrini, and Alexander Loechel are not here or may I'm not recognising their username?